For almost sixty days, a group of approximately 300 soldiers volunteered to attend the Airborne and Ranger Training Brigade. Out of the “students,” 19 of them were female. In the end, two women were able to beat the odds. 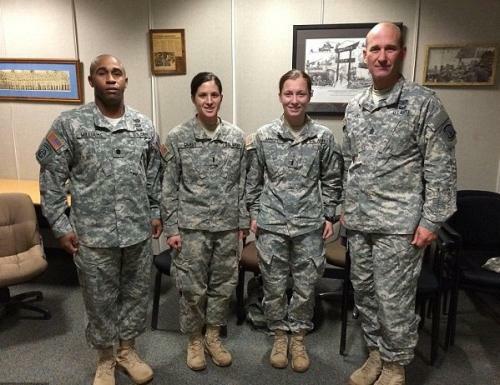 Captain Kristen Griest and Lt. Shaye Haver are the first women to ever graduate from Army Ranger School. So far, they are the only two women out of the ninety-six who graduated in total. Craig Duncan, a student and volunteer in the Veterans Resource Center at BHC, was in the Marine Core for 12 years. He was a part of the 156 who signed up for a thirteen-week Marine boot camp – the longest boot camp for any field of military. By the end of the training camp, only 36, including him, were left. Primarily for this reason, women have had the odds stacked against them in the past. It’s not a matter of who’s right and who’s wrong. It’s a matter of fact — men are, typically, just built bigger. However, now that the first women have successfully endured the three-stage Ranger camp, the next step is to figure out where the women should be positioned. Griest and Haver, if they were like any other male who graduated, would have been able to apply to the 75th Ranger Regiment. The Army has until January 1st to reach a decision on the matter – the Secretary of Defense will make the final call. But it still remains that there are many combat positions available that are simply “off limits” to women. So what are the girls to do? According to http://www.military.com and other resources, Amy Ranger School is one of the toughest training schools a soldier can volunteer for. The three phases of the school are broken down into the following: Fort Benning Phase, Mountain Phase, and Florida Phase. These phases include multiple exercises that include, but are definitely not limited to: close quarters combat, a physical fitness test, enduring rugged terrain and hunger, airborne operations, and being able to survive in jungle and swamp environments. Griest and Haver have already beaten the odds thus far; they’ve proven they are equals to the other 90 plus men who graduated the camp. If you check the record books, the percentage of active-duty military personnel who have earned their Rangers tab is less than five percent. Only time will tell just how much actual combat the women will be allowed to face in the future. Previous Previous post: Will the 2016 elections be “Trumped”?